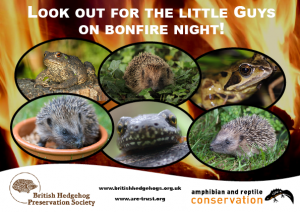 With bonfire night and Halloween fast approaching, the British Hedgehog Preservation Society (BHPS) is urging people to build bonfires on the day they are to be lit to save hedgehogs and other wildlife from appalling suffering. 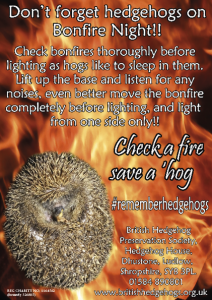 If a large bonfire must be built in advance, protect it whilst building by putting some chicken wire, at least one-metre-high, all the way around the bottom. This should be held in place with stakes and the wire should slope outwards at an angle to make it difficult to climb, as hedgehogs are good climbers! 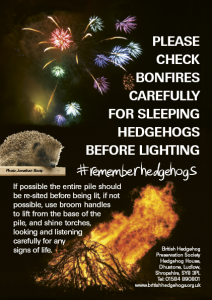 In case you have missed anything light the fire from one side only and keep people away from the unlit side so that any hedgehogs can hopefully escape in peace. 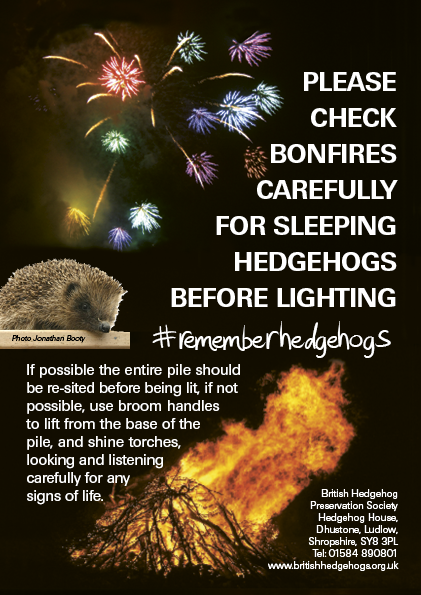 Going to an official organised fireworks display is a far safer option for both humans and animals! A petition on change.org calling on Housing and Planning Minister Kit Malthouse to make the integration of hedgehog highways compulsory in all new build housing developments has taken everyone by surprise. In just two weeks over 300,000 people have signed! Why has this taken the public by storm? 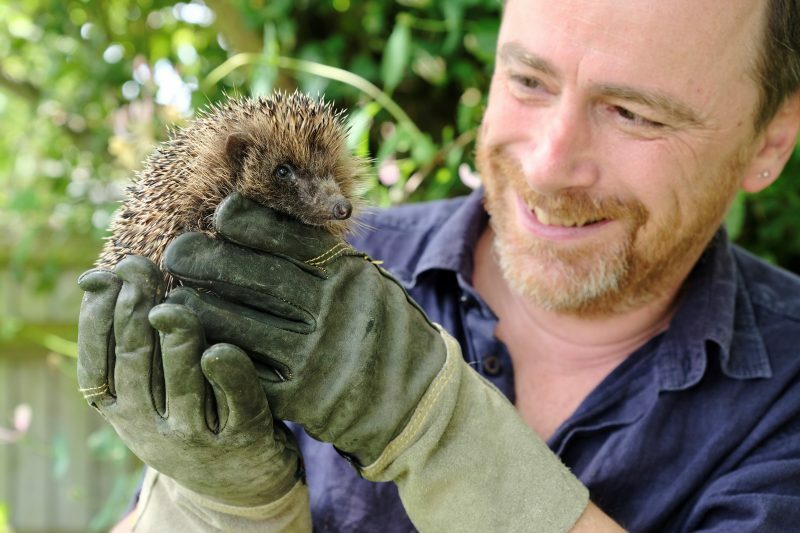 The hedgehog is the nation’s favourite animal – every poll tells the same story. 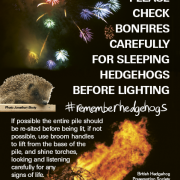 Yet the hedgehog is suffering from a dramatic population decline. The latest State of Britain’s Hedgehogs report from the Hedgehog Street Campaign shows how in just the last 18 years urban hedgehog numbers are down by 30% and rural hedgehogs down by 50%. Perhaps surprisingly, new housing can help hedgehogs, if it is done with wildlife in mind. The petition is calling on Kit Malthouse to do just that – make sure all new fences have hedgehog holes built into them. Just a 13cm square, these holes help hedgehogs move the considerable distances we know they can travel each night – over a mile is not uncommon.